This post has been compensated by The Coloring Table. All opinions are mine alone. 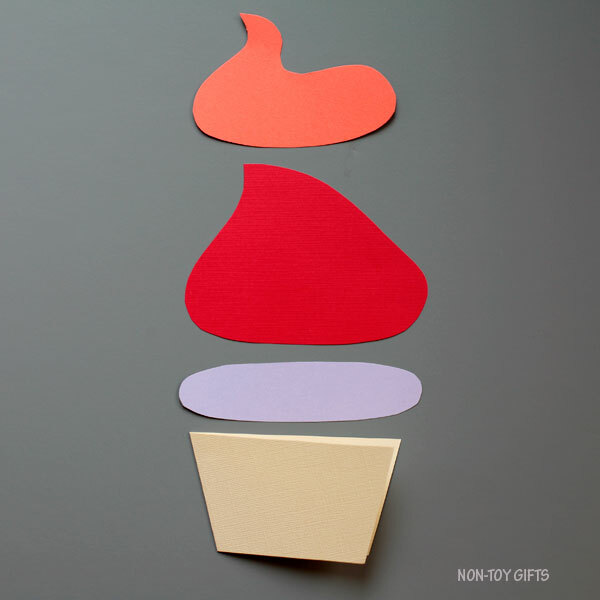 Why buy a birthday card when your kids can make one to hand out to their friends or classmates? It’s more personal and special. 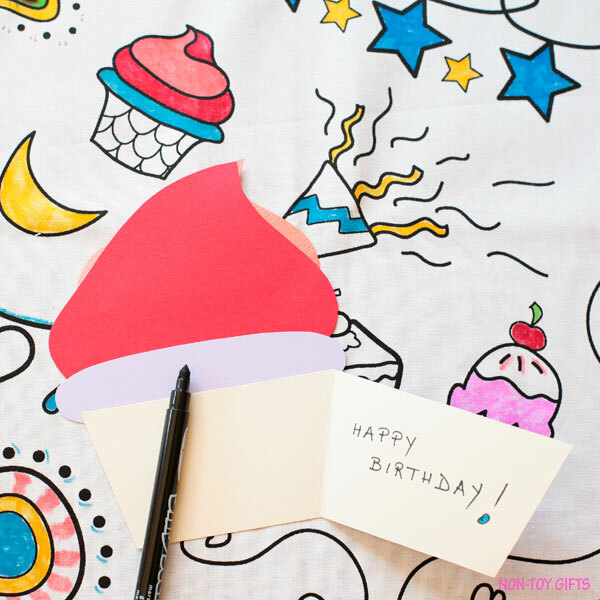 So today we’re sharing a DIY birthday cupcake card idea that is super cute and easy to create. The inspiration for our birthday card came from a coloring tablecloth. My boys love coloring. (My oldest son’s criteria in choosing a restaurant to dine out is if they have coloring sheets or not – This is how much he enjoys it). This made me wonder what other coloring products are out there, besides the classical coloring books. So I did some research and I came across coloring wallpapers, giant coloring maps, coloring cardboard houses, coloring placemats and coloring tablecloths. There are so many! Who would have thought?! Whenever we host a holiday dinner, I like to buy coloring tablecloths for the kids table. They are fun and keep the little ones entertained. The only downside was that once the parties were over, I would have to throw the tablecloths away even if they were only partly colored. And that is because they were made from paper. The kids coloring tablecloth I’m about to present to you is different. It’s a washable fabric tablecloth and this is fantastic. You can use it as many time as you like. Just color, wash and reuse. We got our tablecloth in the mail in the morning, when the kids were in school. So I took out some washable markers and colored my way through the fun birthday design. I threw it in the washing machine before the boys got back home so they could start their own coloring experience from scratch. 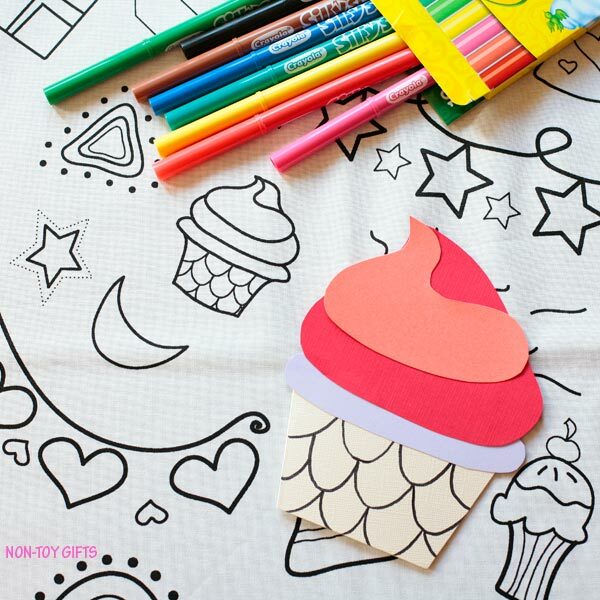 The Coloring Table – the company that produces these coloring tablecloths – has come up with several designs from Christmas to birthday, mandala to fun food. You’ll find the designs on both placemats and tablecloths of different sizes. Our tablecloth is a square and a perfect fit to our craft table. You can find all their products on Amazon, where you’ll have free shipping, if you are a Prime Member, or directly on their website , where you can benefit from a 15% discount from now until October 31st, 2018. 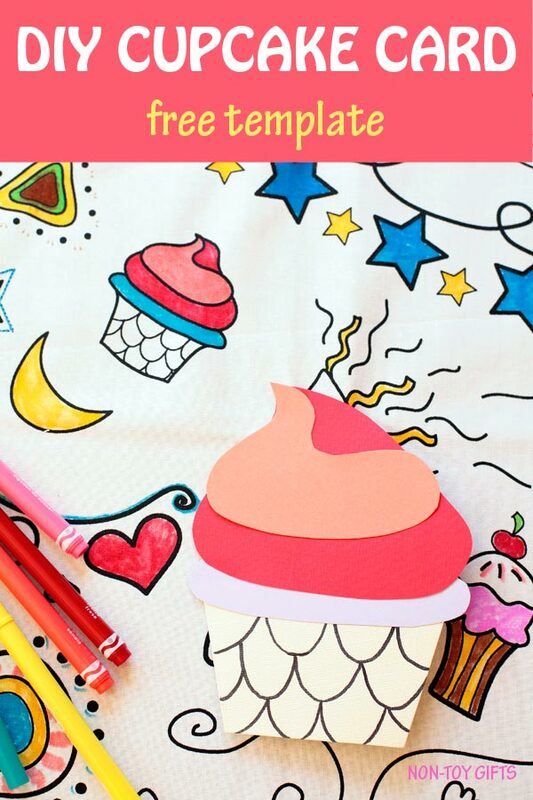 Let’s get back now to our DIY birthday cupcake card. 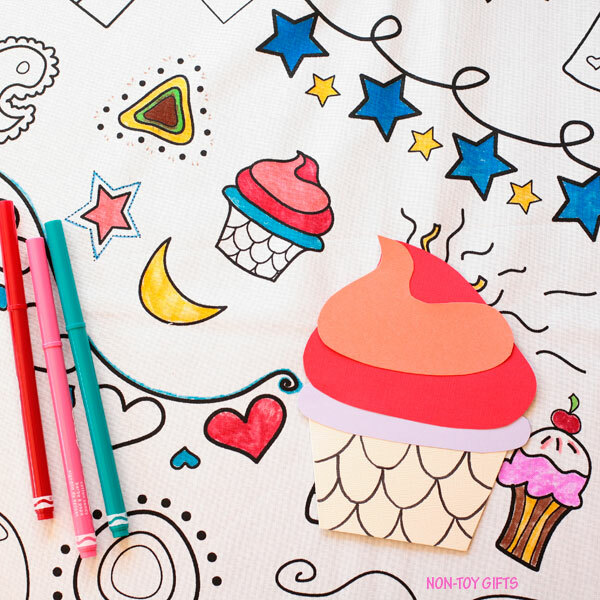 I made it to match the cupcake on the tablecloth and I also included a free template for you. So let’s get crafting! 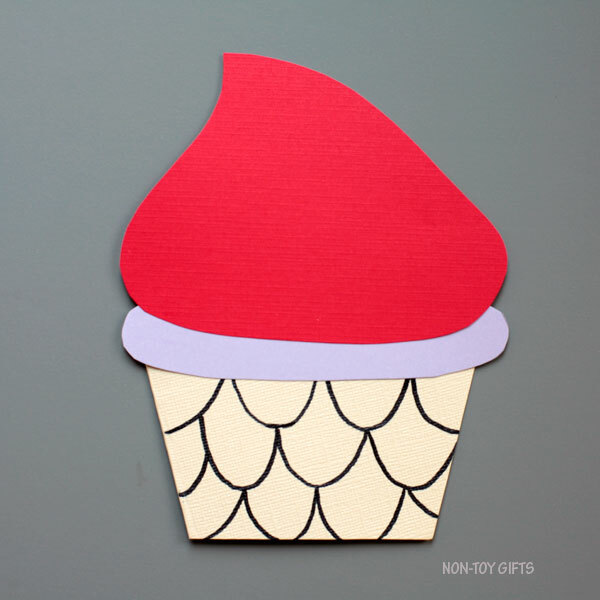 Start by downloading the free birthday cupcake card template. 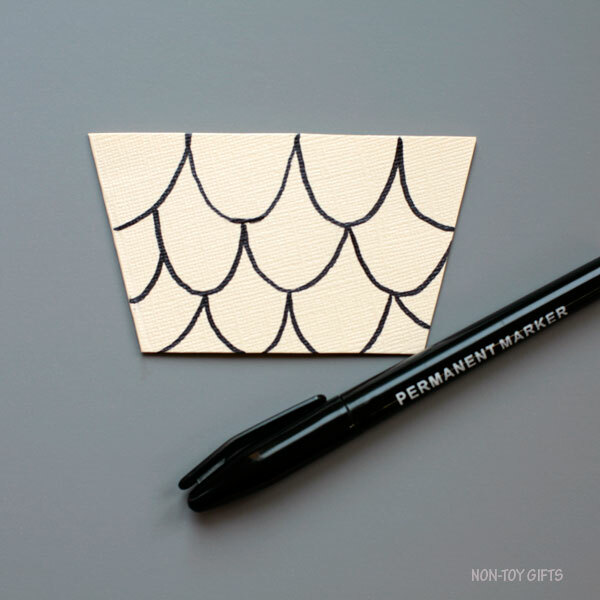 Cut out the patterns, trace them on cardstock paper and cut them out. 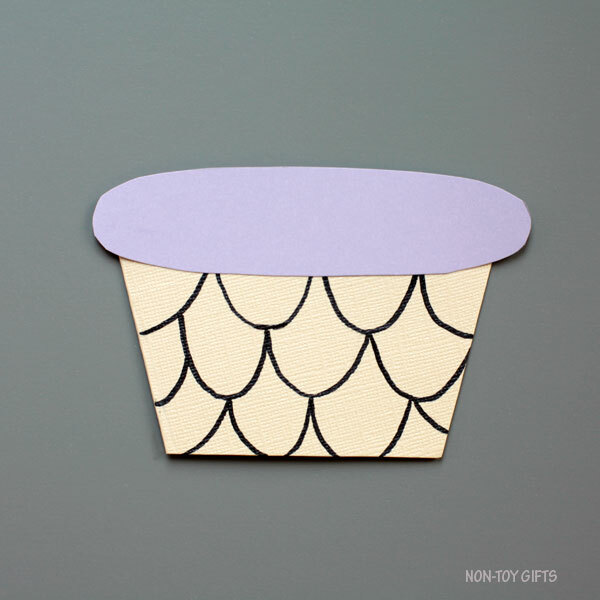 For the cupcake liner, you will have to fold the cardstock paper in half and align the left side of the pattern to the fold. 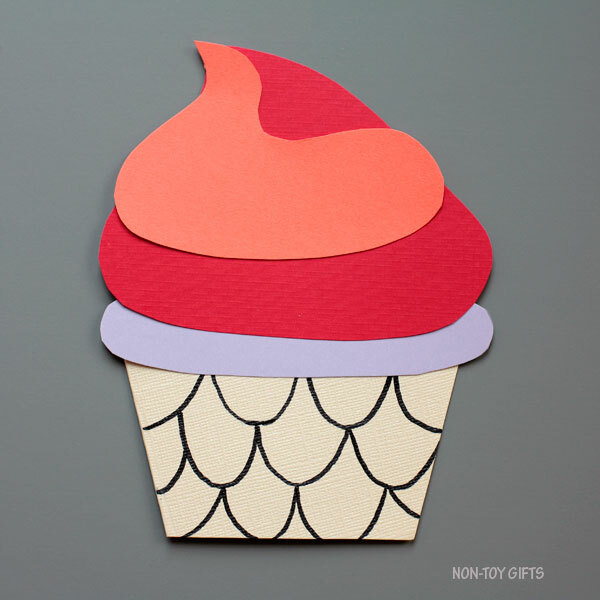 We used ivory cardstock paper for the cupcake liner and three different colored cardstock paper for the cupcake layers. One color for each layer. 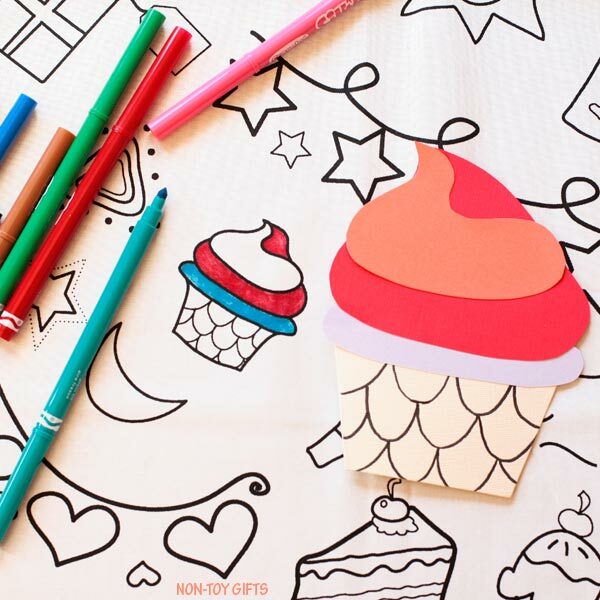 Use a black marker to replicate the cupcake liner design from the coloring tablecloth. Glue the first colored layer on top of the cupcake liner. Continue with the second and the third until you have the entire cupcake card assembled and ready. Make sure to follow Coloring Table on Facebook, Pinterest, Instagram and Twitter.